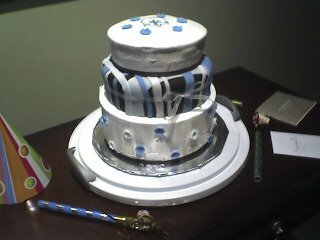 I finished this cake yesterday for Stephanie, Jay's assistant's birthday. She just turned 26. She was the one who inspired me to take the cake decorating classes as she has taken them and makes beautiful cakes herself. The flowers are made from colored fondant and painted with cornflower blue icing color. That was a special birthday gift for Swahler.